Please help us guide our students in their career choices. 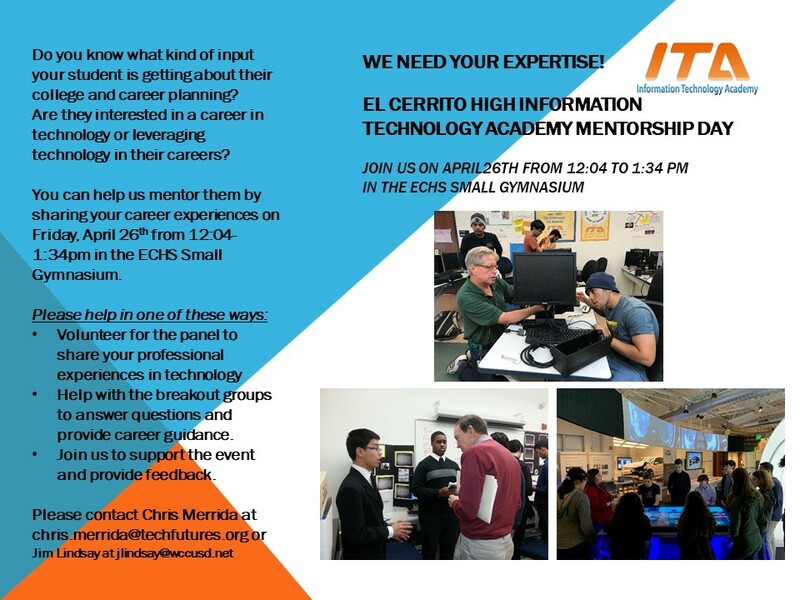 During the past school year the ITA Advisory Board has worked on developing a meaningful Career Day that includes abundant one-one-one conversations about Careers in Technology and Technology in Careers. Please help us with our initial event for about 40 students on Friday, April 26th, from Noon to 1:35 pm, in the ECHS Small Gymnasium. Volunteer for the panel to share your professional experiences in technology. Help with the breakout groups to answer questions and provide career guidance. Provide constructive feedback for our next iteration. Let us know you are interested and willing to help in the future. 5 min: moderator welcomes students and lays out format/goals for event. Panel members briefly introduce themselves: name, career, company, etc. 45 min: moderator-led panel discussion of 10-20 questions previously submitted by students and provided to panel members. 40 min: Industry professionals ask each student to describe their career goal; what are they currently doing to prepare for that career. One on one discussion with industry professionals offering suggestions, encouragement, questions, etc. to help each student achieve their goal.